You love to shop online. But who can make decisions so quickly? Shopping baskets expire before you can do all the comparisons and decide on that camera, or that dress. Taking screenshots of your basket is tedious, handling printouts is lame. And how do you share your fabulous findings, if the links to the products could expire at any moment? 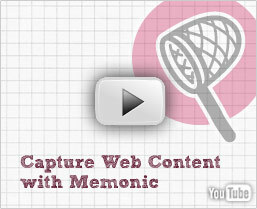 With Memonic, quickly save any online shopping content from any of your favorite shopping sites. Organize your findings in folders, tag them, and if you like - publish them internally and externally. Let your friends subscribe to a RSS feed instead of sending bulk emails if you want to always make your shopping favorites available, or start a group for your particular shopping expedition. Your clipped notes will always be stored in an online archive for easy editing and sharing. And with Memonic, those shopping baskets won't expire! Memonic offers you a timely solution to create your shopping decisions - with no pressure from the online shopping basket - or that pesky sales clerk!